The Gokyo Lakes Trek to Everest Base Camp is a variation of the traditional trek to Base Camp that offers additional sights and the wonderful opportunity to experience the beauty of the highest freshwater lake system in the world. 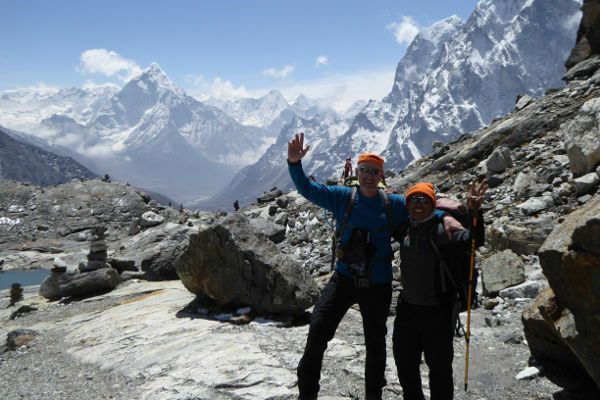 This is all in addition to visiting the Everest Base Camp and high-point of Kala Patthar – two of the highlights of the standard base camp trek. The route parts with the classic Everest Base Camp Trek at Namche Bazaar and heads west up the Dudh Koshi valley towards Gokyo Lakes and the trekking peak of Gokyo Ri. Expect quiet trails that allow you to focus on the sheer natural beauty of your surrounds – a much more varied and verdant landscape than on the classic trek. Because of the route’s circular nature, you will not have to retrace your footsteps on the return leg of the trip as you would have done on the standard base camp trek. After spending some time relaxing at the turquoise glacial lakes you will summit Gokyo Ri only to be blown away by some of the most stunning views of Everest (8,848m), Lhotse (8,516m) and Cho Oyu (8,201m). From there you will ascend one of the iconic ‘Three Passes’ in the region – Cho La pass – over which you will re-join with the main trek up to Gorak Shep. You will have the opportunity to visit the trekker’s photo point at Everest Base Camp before setting out on the trek up Kala Patthar the next day – another iconic viewpoint in the region. This article covers the Gokyo Lakes to Everest Base Camp Trek by providing a detailed, day-to-day itinerary, map and by answering various questions on when to go, what to pack and how much it will cost. How much does the Gokyo Lakes Trek Cost? When is the best time to trek the Gokyo Lakes route? What gear should I pack for the Gokyo Lakes Trek? 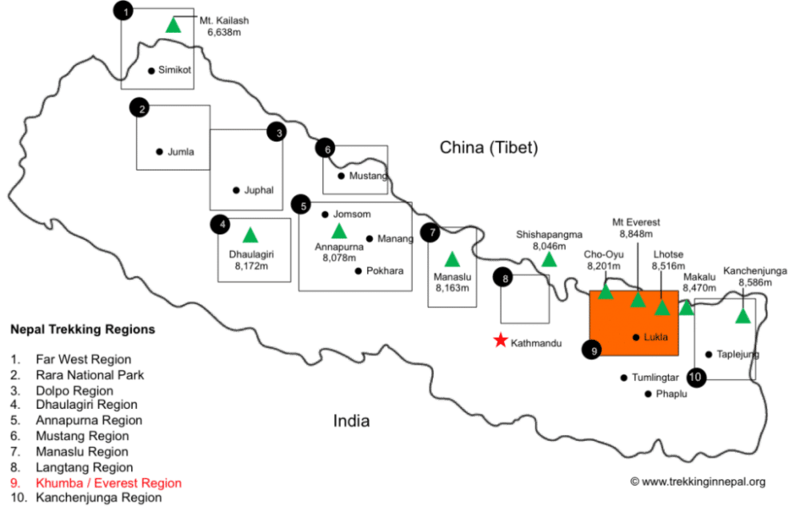 The trek takes place in the Everest or Khumbu region of Nepal as shown by the orange block on the map below. After flying into the capital, Kathmandu, you will take a short flight into Lukla where the classic Everest Base Camp Trek as well as the Gokyo Lakes Trek begins. 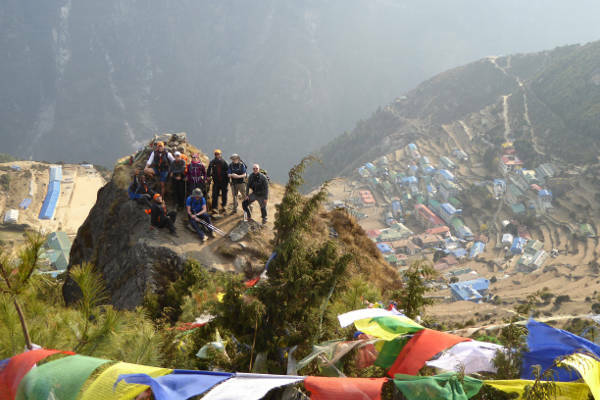 For an alternative to flying into Lukla airport, consider the Jiri to Everest Base Camp Trek – a variation which starts with a bus ride before trekking most of the way in a fashion similar to the early pioneers of the region. This map provides a schematic representation of the trek to Everest Base Camp via Gokyo Lakes. After flying into Lukla, the trek starts along with the classic trek heading north through Phadking. At Namche Bazaar, the route forks left and passes through the small town of Dole and Machhermo before reaching the Gokyo Lakes in the north-west. After the summit of Gokyo Ri is completed, the route heads east over the Cho La pass towards Tengboche and Pheriche, where it joins up with the main Everest route. From here you follow the Khumbu Glacier up to Gorak Shep and eventually Everest Base Camp. After climbing up Kala Patthar, the route descends through Dingboche on the classic trail before reaching Namche Bazaar and finally Lukla. Taking a guide on the Gokyo Lakes Trek is a great way of ensuring you make the most of your time spent in the Khumbu region. The Gokyo Lakes variation is also much quieter than the classic trek, so an easy-to-read map can come in handy when navigating through the valley. 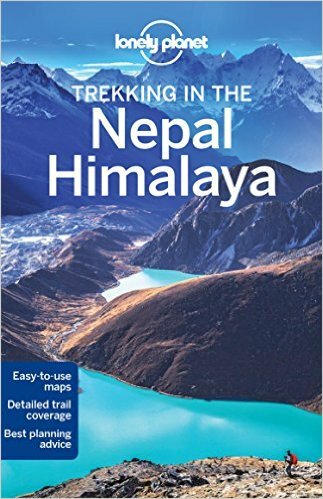 The Lonely Planet Trekking in Nepal Himalaya guide is updated regularly and is a well-known, trusted resource used by many trekkers worldwide. The guide is very detailed and contains information for many treks, meaning you can use it more than once! For an excellent trekking map we recommend: Nepa Maps 1:50,000 Gokyo and Everest Region Map. As with the popular classic trek, the Gokyo Lakes Trek also starts in Lukla after a short, yet memorable flight from Kathmandu. The outward leg of the trek takes you north-west through the Dudh Koshi valley before looping around after Gokyo and returning along the classic route. The entire trips lasts around 17 days, of which 2/3 days will be spent in Kathmandu pre and post the trek. This is a few days longer than the traditional Everest trek – accommodating the countless extra sights you will come across as you make your way to the base camp. Arrive in the capital city of Kathmandu. If you have booked your trip with a tour operator they will usually provide airport transfers and will have arranged your hotel. If you are travelling independently there are loads of taxis at Kathmandu airport (just make sure you agree a price before you get in the taxi) and we recommend staying in the Thamel district. ​A short morning flight will take you to Lukla Airport. The flight is quite an experience itself so be sure to bring your camera with! After touching down in Lukla, the trek begins with a short descent to Phadking, passing various Buddhist sights along the way. Find our more about the flight to Lukla here. A full day’s trekking will take you into the start of the Sagarmatha National Park. A steep finish to the day will bring you to Namche Bazaar (3,440m), the central trading outpost of the region. Explore the village and stock up on some much-needed snacks for the next few days. Be sure to check out the weekly market if you happen to be there on a Saturday! Please note: many people split day 3 into two parts, stopping for the night in Phakding before continuing onto Namche on day 4. 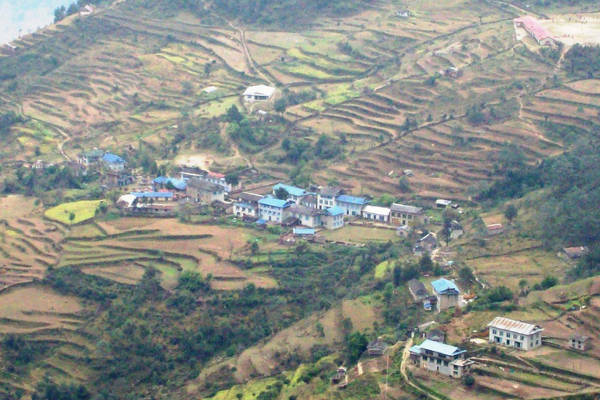 Spend the day acclimatizing in Namche Bazaar by exploring the area steeped in tradition. A short hike to the Everest View Hotel will give you a chance to catch your first glimpse of the famous mountain, as well as the imposing Ama Dablam. The trek now separates from the main Everest route and heads north-west up the Dudh Koshi valley towards Dole. You should be able to snap some amazing pics of Everest, Lhotse and Ama Dablam as you cross one of the early ridges. A fairly steep day of trekking will take you up 500m in altitude towards Machhermo. Keep your eyes peeled to see some of the yaks during the summer months. Once again, you will be treated with some of the best views of Cho Oyu and the surrounding peaks as you trek. Try to keep your head up to take in some of the beauty! Your second acclimatization day will be spent at Machhermo. Use the time to seek out the views of the Ngozumpa Glacier – the largest glacier in the Himalayas. After a good day’s rest, make your way to the first of the lakes – you won’t be able to miss them with their striking turquoise water standing in stark contrast to the landscape of the region. After the third lake, you will reach the village of Gokyo where you will be staying for the night. An early start to the day is needed for the summit of Gokyo Ri. At just below 5,500m, the summit offers wonderful views of Everest, Lhotse and Cho Oyu. Keep your fingers crossed for good weather! Descend later that morning and then cross the Ngozumpa glacier before heading to Dragnag for the night. Be prepared for a long day as you traverse one of the ‘Three Passes’ – Cho La. Take your time as you tackle the rocky trail over the pass, reaching 5,420 at its highest point. From here you will cross the glacier on the other side of the Cho La and descend to Dzongla. Rejoin with the main Everest route as you pass through Pheriche and Tengboche, where you will find the largest monastery in the area. The trek from Pheriche to Lobuche passes many memorials to Sherpas and climbers who have died climbing Everest. You will spend the night in Lobuche. The day is spent hugging the Khumbu Glacier as you make your way up to Gorak Shep and eventually Everest Base Camp. 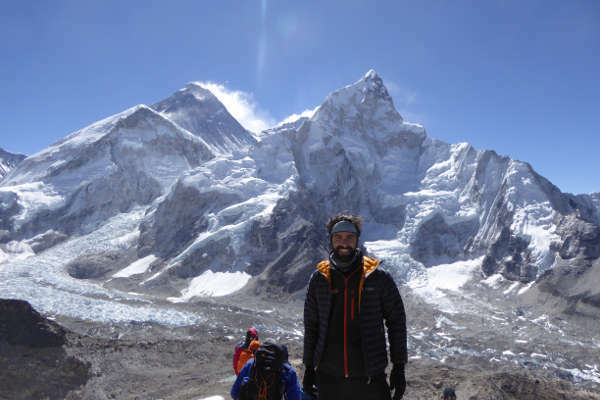 Tour groups are not typically allowed to stay in base camp for long, so take the opportunity to get a feeling of the buzz and excitement of potential summiteers of Everest (if you visit during the climbing season – April / May). Descend back to Gorak Shep for the night, passing great views of the infamous Khumbu icefall. 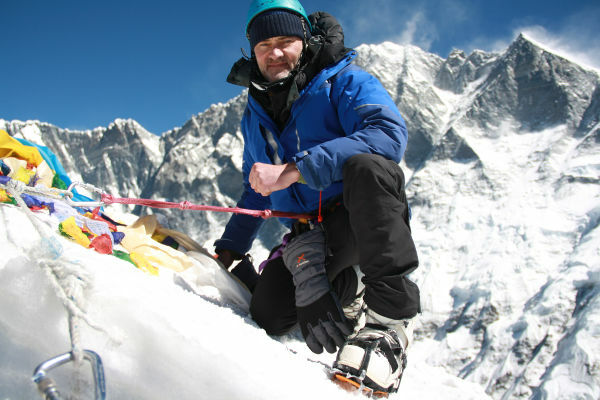 Ascend the trekking peak of Kala Patthar for more breath-taking views of Everest and the surrounding peaks. Descend that afternoon to Dingboche, following the classic route. Descend back to Namche Bazaar via Tengboche. Keep your camera on you as you pass through the rhododendron covered slopes – making for a great photo. Finish the trek with the descent to Lukla, through the Dudh Koshi valley. Catch up on some much-needed rest and possibly a few drinks to celebrate what is sure to have been a memorable trip! 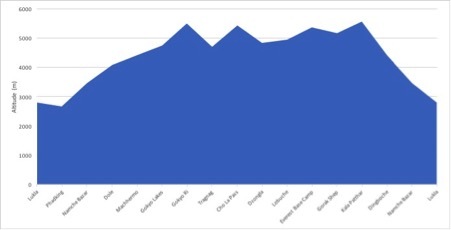 This chart shows the altitude profile of the typical Gokyo Lakes to Everest Base Camp Trek, starting in Lukla and reaching the high-points of Gokyo Ri, Cho La Pass and Kala Patthar. 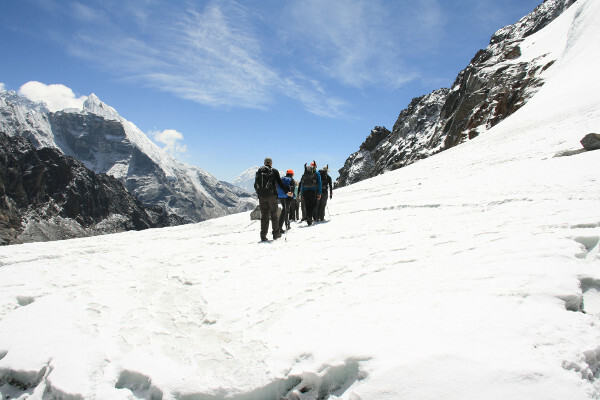 A significantly greater part of the trek is spent above 4,000m when compared to the traditional Everest Base Camp Trek. The ascent profile is also steeper than the traditional trek – contributing to the increased difficulty of this variation. The Gokyo Lakes to Everest Base Camp Trek tour package tends to cost £400-£500 more than the classic Everest Base Camp Trek – mainly because the trek is longer, therefore requiring more accommodation, food and guides. Trekking independently is not recommended for this variation because the routes are much less busy and the trek in general is more challenging. A tour operator will organise all accommodation, food, permits and communal equipment as well as provide well-trained guides. Packages will cost in the region of £1,200 to £2,500. Read our detailed article on the breakdown of costs for the classic Everest Base Camp Trek here. As with most treks in the region, it is best to avoid the peak of summer when the monsoon season is at its zenith by trekking in the shoulder months either side of it. During these months, the weather tends to be stable and dry – making for good trekking and sightseeing conditions. The pre-monsoon months of February to May are a popular time when the mountain is at its greenest. September to October are considered the best months to trek on the other side of summer. 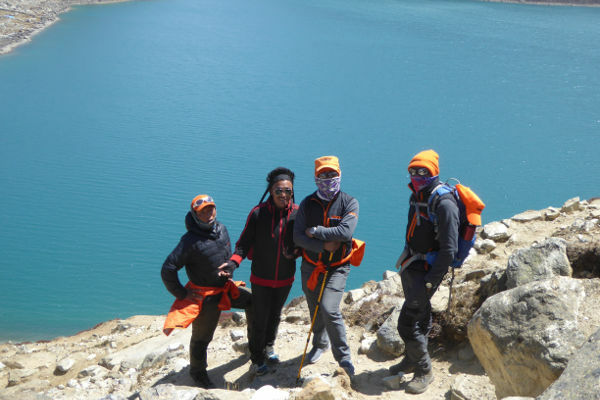 Trekking during peak season should not be much of an issue on the Gokyo Lakes to Everest Base Camp trek as the route avoids the crowds of people tackling the classic trek. Find out more information on weather and the best time to trek in the Everest region. If the classic Everest trek is considered an easy trek, then the Gokyo Lakes variation may be considered moderate. While no previous trekking experience is required, the trek does involve 5-7 hours of trekking per day on hilly/rocky terrain at high altitudes. Much of the trek is spent above 4,000m and altitudes of over 5,500m are reached when traversing passes and trekking peaks. We do recommend training a few weeks to months beforehand so that you will be comfortable walking similar distances on the trek. Here is our EBC trek training guide. The itinerary of the trek is designed to provide enough time for the body to acclimatize to the high altitudes. If you follow the guide and don’t rush the ascents, you should be fine. Most high-points on the trek are peaks or passes which will be descended shortly after reaching the top – following the principle of ‘climb high, sleep low’. Altitude sickness can affect anyone, regardless of fitness or age, so it is still vital to read up on the symptoms and different variations of the condition. Our detailed article on acclimatization and altitude sickness is sufficient reading preparation for the trek. The packing list for a trip of this length is quite extensive, so we have compiled an article that details what you should bring and which brands offer the best value for money. Read the Everest Base Camp packing list for our recommendations based on past experience of trekking in Everest. The most popular trek in the region, the classic Everest Base Camp Trek starts after a flight into Lukla. From there the hike begins with gradual ascents each day through various villages and small towns as you head north through the Khumbu Valley. The trek takes you through the villages of Phadking, Namche Bazar, Tengboche, Pheriche and Gorak Shep before reaching the Everest Base Camp. You then retrace your footsteps as you head back down the valley, using the same route. The trek is very popular during peak trekking season with over 30,000 people completing it annually. It typically lasts 14 days and covers 130km of trekking that involves covering an average of 15km per day over 5/6 hours. 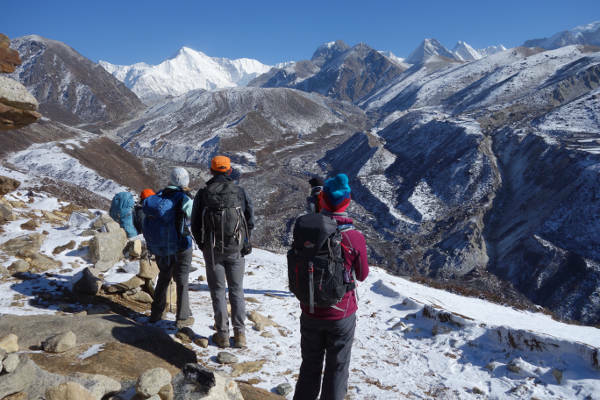 The Three Passes Trek is a tougher variation than the classic Everest Base Camp Trek because it involves crossing three very high passes as well as summiting some walking peaks which are not included on the classic trek. The variation starts by following the classic trek from Lukla to Namche Bazar before veering west towards Thame and the remote Nangpa Valley. The first of the three passes encountered is the Renjo La, where you will be afforded magnificent views of Everest before descending to the idyllic Gokyo lakes. The next pass, Cho La, involves walking up a fairly steep and icy trail before reaching a small glacier at the top. From here, you descend and re-join the main base camp trek where you summit Kala Patthar – the iconic viewpoint. You continue onto base camp itself before descending to Lobuche. You then head east over the third pass of Kongma La and continue onwards to summit the third peak of Chukking Ri. Once again you will have amazing views of the surrounding peaks that you would not get to see on the classic trek. The circuit is completed by returning to Lukla through the main Everest trail. Hi Ray, his name is Pimba. All the best! Hi Mark, lots of good info on your site. Thank you. I am 53 and planning to do the Gokyo Valley Trek returning down the Eastern side of the valley in November with my 17 year old son. We have done hikes of up to 7 days in NZ but never at altitude. I have starting a training program but a little concerned about the difficulty of this trek. We will take it slow and have lots of rest days however and get to Gokyo in 7 or 8 days before returning. Any other tips ? Hi Emma, you both sound fit and more experienced than the average trekker in Nepal. As long as you take a slow ascend to Gokyo you should be absolutely fine and have a blast. My only tip would be to take yak tracks for the Cho La pass. It can get quite snowy in November so additional grip is never a bad thing. We are planning to do Jiri to Ebc with the Gokyo Ri and Cho la pass. We would like to start from Jiri around the last week of february. Do you think the Gokyo ri and Cho la pass will be open and safe when we will be there? 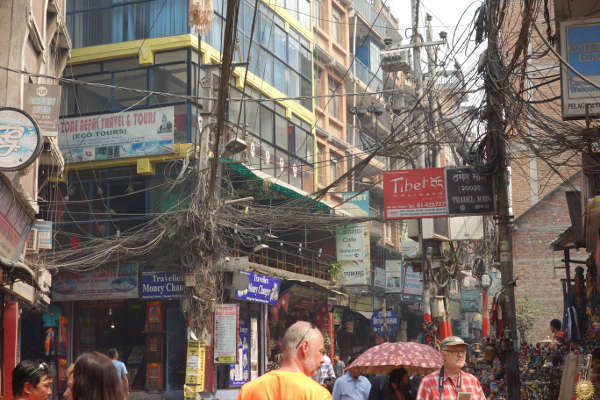 Also, we want to buy or rent a third layer in Katmandu. Do you have any shop you would recommand? Great web site! My son and I are considering the Gokyo Lakes route. We went up Kilimanjaro last year and the only altitude effect I experienced was loss of appetite. Although the quality of food was not the issue, I’d like to take food quality out as a factor I have to worry about. Hence I’m leaning toward trekking companies that cook their own food and provide boiled water. Am I being too squeamish? Hi Jim, most trek operators use teahouses, where food is prepared by the teahouse proprietors for trekkers. teahouses on all Everest trails are pretty good nowadays. Most offer a wide and varied menus. Trek companies arrange your stays at each teahouse and will provide purified water. To find our more about teahouses see here: https://ebctrekguide.com/teahouses-on-the-everest-base-camp-trek. Cheers! HI There. I was thinking of taking the Gokyo Lakes trek from Lukla to Dhole and Gokyo and then take the extra step ChoLa Lobuche and Everett Base Camp. When you say hug the Khumbu Glacier – is this a dangerous hike or if we are fit and have hiked before, is this something that is doable or do we need to be experts in hiking glaciers. Also how many extra days should I be thinking of if we decide to do the extra route? Thanks! Hi Donna, the hike is not particularly dangerous, apart from altitude sickness risks, but there are areas where more caution should be taken. For example, crossing the Ngozumba glacier and the Cho La Pass comes with more risk than other areas of the hike. I would recommend taking 3-4 days more to do the Gokyo Lakes trek (i.e. 17-18 days in total). Whether is it advisable to do first EBC and then Go Kyo Ri i.e. anti-clockwise instead of conventional Go Kyo Ri first and then EBC later? Hi Hermant, I prefer the anti-clockwise approach as their is more time to acclimatise, but many people follow a clockwise route too. My advise would be to do an anti-clockwise route though.